The most beneficial thing that I have gained by attending workshops is participating in critiques. And, although subjecting my pots to open opinion was uncomfortable, I have had really positive experiences and gained a lot of insight. Self-critiquing is a powerful skill that is worth incorporating. Since I have been conducting self-critiques and critiques with Julie, I am more cognizant and focused about what I want to make. I have begun to balance awareness of my weaknesses with recognition of my strengths. And, I know what I want to do and what I want to try which makes me feel more confident. For me, there are two main categories – technical (throwing questions) and aesthetic (design questions). One of the most important aspects of a self-critique is the ‘why’. Asking ‘why’ makes the initial and emotional responses to the pot tangible. It also keeps me from being lazy and casually dismissing a pot. What is the first part of the pot that I notice and why? How does it feel (sharp, heavy, smooth)? Is that what I intended? Does it work? What do I need to be mindful of the next time I make this shape (more clay, throw thinner, leave rim thicker, clean up better, stronger attachment)? Does this pot ‘work’? Why/why not? Is it balanced? Should it be? Does the surface embellishment enhance/hide the pot shape? Does the glaze hide/enhance the surface embellishment? Does the glaze enhance/hide the pot shape? Is that good? Why/why not? Does the transition from one glaze to another work? Why/why not? What will I change the next time I make this form (glaze, texture, shape)? What questions do you ask yourself about your pots? 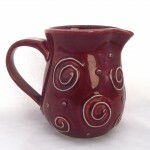 Creamer – Swirl designs make the creamer feel fun. 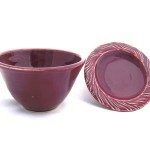 The raspberry glaze breaks wonderfully over the raised slip – more successful harmony between glaze and texture. Bowl Set – The rim is a good choice for carving because it gives a defined space for texture. However, some of the carving is lost in the raspberry glaze.